Christina Ford, an employee at a Wal-Mart in Washington, D.C., in 2013. Wal-Mart announced last week that it will partner with Green Dot, an issuer of prepaid debit cards, to offer low-fee checking accounts to customers in all Wal-Mart stores. The service, GoBank, will offer checking accounts with no minimum balance and no overdraft fees. The monthly service will cost $8.95, but that fee is waived with at least $500 per month in directly deposited funds. Wal-Mart’s move into banking may seem odd, but if the behemoth is looking to serve its customers, bank accounts are a natural product. There are more Wal-Mart stores in areas where a higher percentage of the population is unbanked — that is, without a checking or saving account. According to the most recent National Survey of Unbanked and Underbanked Households, conducted by the Federal Deposit Insurance Corp. (FDIC) in 2011, an estimated 8.2 percent of U.S. households are unbanked, or about 10 million households. Combining Aggdata.com’s complete list of Wal-Mart stores with the FDIC data, we can statistically analyze the relationship between the world’s largest retailer and the unbanked in the U.S.
By state, the percentage of households who are unbanked ranges from 1.9 percent in New Hampshire to 15.1 percent in Mississippi. And the number of Wal-Mart stores per million people ranges from five in New York and seven in New Jersey, on the low end, to 28 in Oklahoma and a whopping 37 in Arkansas, where Wal-Mart was started. 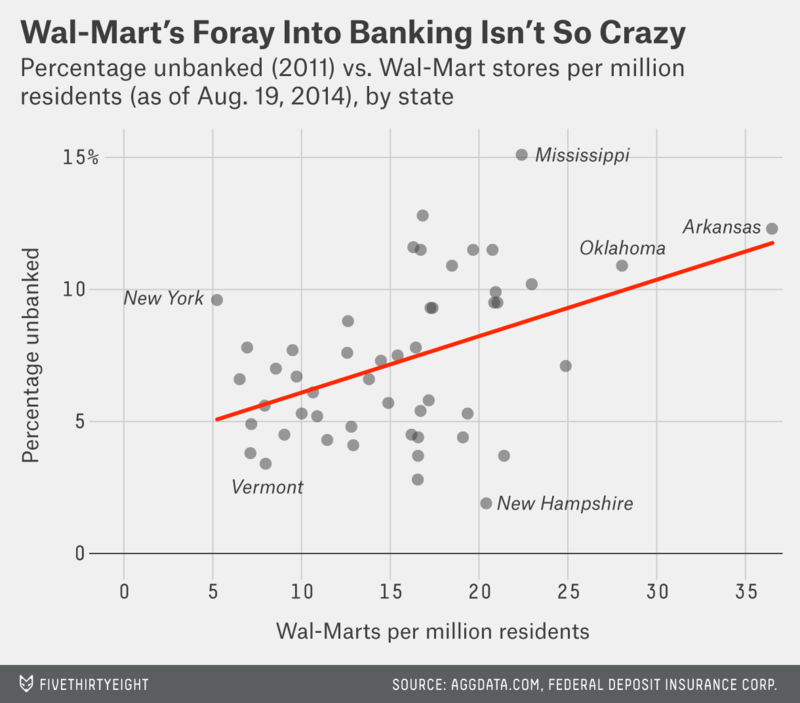 Overall, states with more Wal-Marts tend to have a higher percentage of unbanked households. This relationship is statistically significant, although there are some outliers. Arizona and Texas have a higher percentage of unbanked households relative to the proportion of Wal-Mart stores. 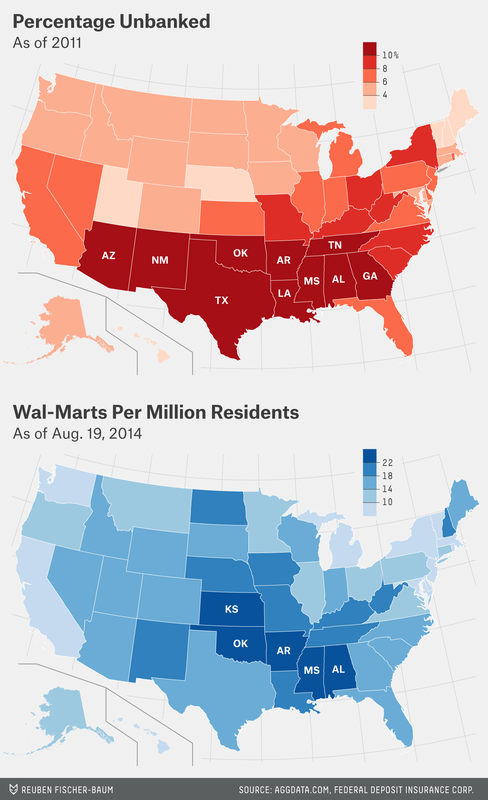 Whereas in Utah and Nebraska, more people have accounts than we would expect given the number of Wal-Marts. Deterred from opening a traditional account — perhaps because of minimum-balance requirements — the unbanked instead rely on payday loan or check-cashier services, usually at a higher cost. For those with checking accounts, many pay hundreds of dollars per year in overdraft fees. And accessibility matters for the unbanked, too: There are about 4,300 Wal-Mart stores in the U.S., and GoBank says it will have 42,000 ATMs.